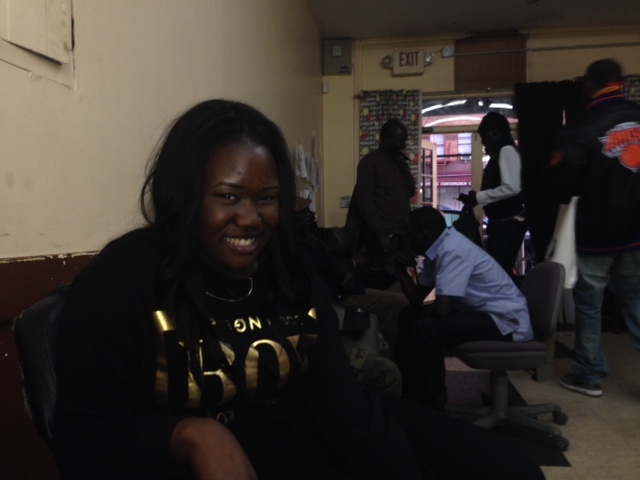 What’s next for Harlem’s Little Senegal? The family Cheikh Lo left behind in Senegal when he moved to New York. Photo contributed. The mouth-watering aroma of grilled fish stewed with vegetables and sizzling hot peppers drifts through the air, tempting passer-byers decked out in vibrant robes and elaborately tied headscarves. Between the sights, smells and mind-boggling cacophony of French and Wolof, it feels like a scene straight out of Dakar. But in fact, it’s 116th street in Harlem, New York, the backbone of Little Senegal, a bustling neighborhood of West African immigrants. 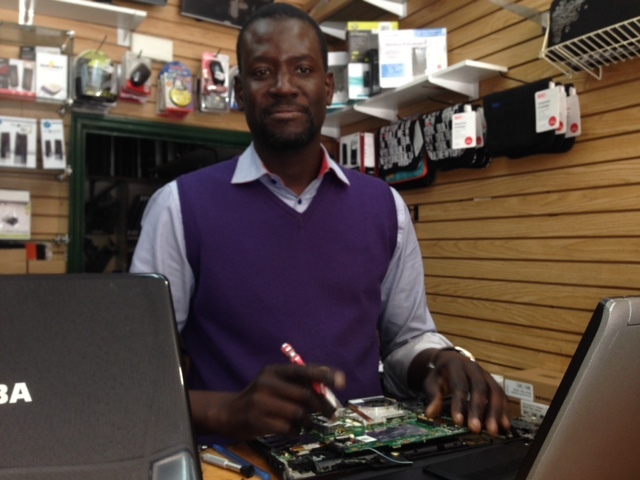 Mandoye Ndiaye owns a computer repair store called Afrik PC on the commercial strip. He said the area is indeed a home away from home. But when push comes to shove, it’s just not the same. Mandoye Ndiaye runs Afrik PC, a computer repair shop. Photo by Maggy Donaldson. He said he came to New York for work experience so he could reinvest his skills back home. It’s still his plan: He’s hoping to start building a house in Senegal within the next few years. 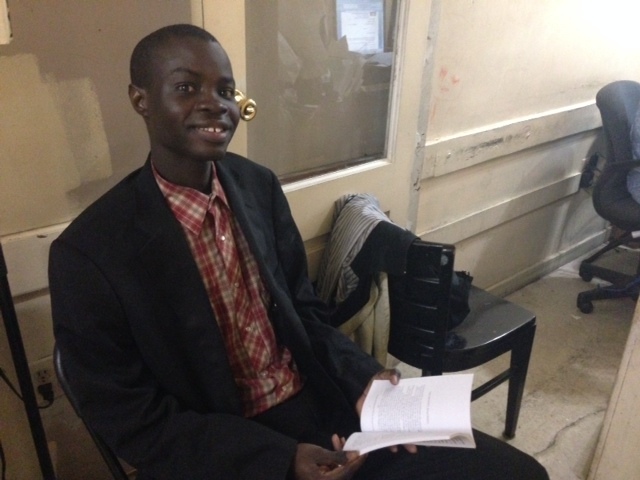 Mandoye Ndiaye’s story is common for the older circle of Senegalese immigrants. But many of the youth were either born here or arrived young enough that New York isn’t really their home away from home; It is home. Mamediarra Ndiaye (no relation to Mandoye Ndiaye) was born to Senegalese parents but has lived in New York all of her 21 years. She said she loves vacationing in Senegal, but doesn’t feel like she’ll ever settle there permanently. Mamediarra Ndiaye at the Association des Senegalais d’Amerique. Photo by Maggy Donaldson. 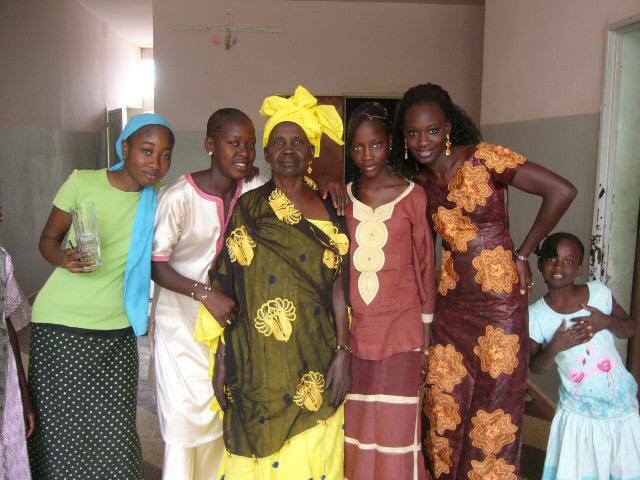 According to Mamediarra Ndiaye, life as a young American living in a Senegalese household is no cakewalk. She says tensions really flare between her and her father when it comes to matters of the heart. Mamediarra Ndiaye has started attending meetings of the newly formed youth association at the Association des Senegalais d’Amerique (ASA), the community center for the Senegalese. She’s joined by her 21-year-old peer Cheikh Lo, who came to New York in 2008 to live with his father and round out his education. 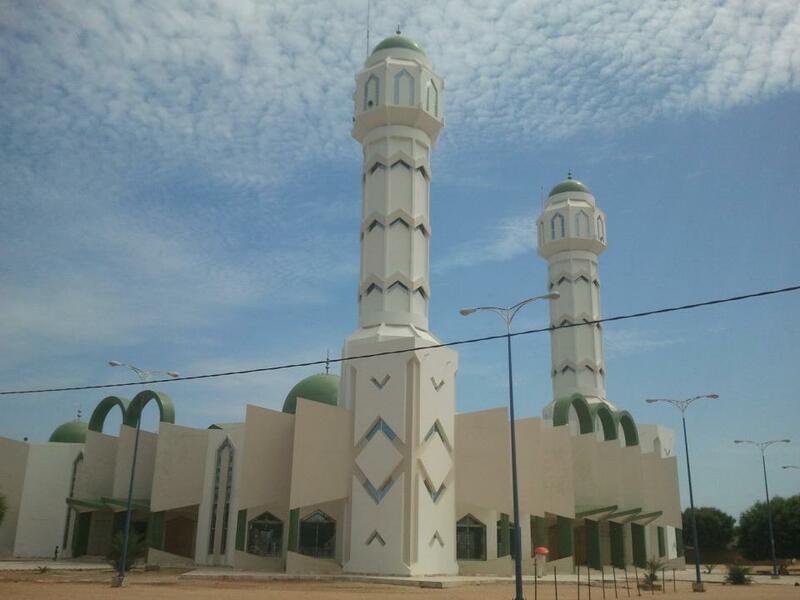 The grand mosque in Taif, Senegal, Cheikh’s hometown. Photo contributed. After coming to the United States, though, Lo does sense growing divisions between the young and old of Little Senegal. Lo speaks from personal experience. As soon as he turned 18, still in the middle of his senior year of high school, his father told him that as a new adult, he must leave home and fend for himself. Lo crashed with a friend for a month until he could find a job. He started waiting tables at an oyster bar while finishing school, working long days to get everything done. Now he’s a third-year political science student at Bronx Community College. Completely self-sufficient, Lo said he’s finally at peace with his father. Cheikh Lo with his recently published book. Photo by Maggy Donaldson. “That’s why I wrote this book,” he continued, waving a newly minted copy with a wide grin. “Because I could do it. Jebe Diagne is trying to link the young and old of Little Senegal. He runs the youth association meetings at the ASA. He fears for the future of the community because of the growing generational gap. Diagne hopes that by giving Senegalese youth a space to air their concerns, the community can foster a new inter-generational dialogue. As a member of the next generation of Senegalese, Lo is confident that he and his peers can help narrow that gap.